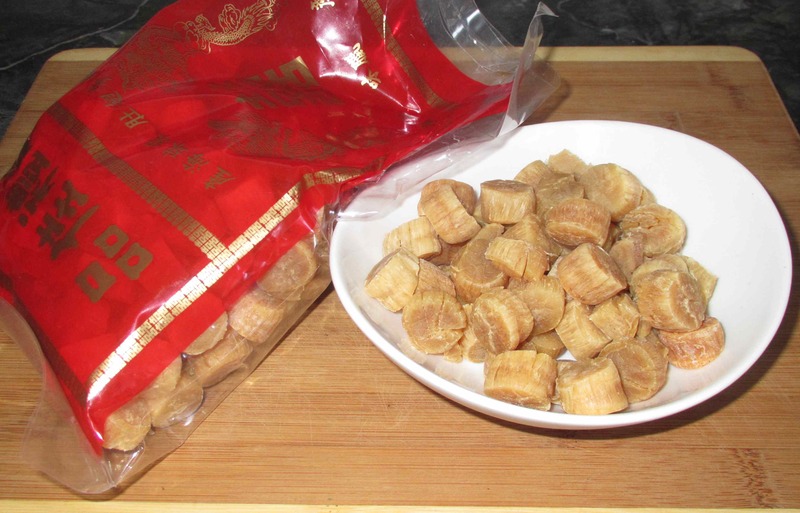 You may sometimes see dried scallops referred to as ‘Conpoy’ in cookery books. This is the Cantonese pronunciation of the Chinese characters ‘乾貝’, which are pronounced ‘gānbèi’ in Mandarin. Conpoy don’t appear often in dishes in westernized Chinese restaurants, but in those with traditional Chinese preparations you may come across them referred to on the menu as ‘瑤柱’ or ‘瑶柱’. These characters actually stumped me in the past as they translate to ‘Jade Pillars’, which, while somewhat poetically descriptive, I suppose, don’t actually suggest the article in question. The largest ones I currently have on hand are about an inch across in greatest diameter, but I have seen some that are even larger than that. The smaller ones are useful when used whole in soups and the like, but I especially favor the medium sized ones as being the most versatile. Here you can see the different sizes in a bit more of a close-up shot… Some conpoy can be very dry while others, particularly the smaller ones, can have a much higher moisture content and possess a supple springiness to their texture. For storage, I like to keep all the different types in the fridge but the drier ones can actually be kept on the shelf in a cool, dark place as well. Eventually however, the flavor will fade and about a year is about the longest I would attempt to keep them. As for the taste, imagine the sweetness and umami marine flavors of fresh scallops increased by a whole order of magnitude. The intensity is remarkable and I love eating them dry like little nuggets of seafood jerky. They are extremely addictive this way, like candy, actually, but you need to exercise a little restraint as they make for a very expensive snack food indeed. In fact, the medium sized ones you see in the first picture cost my wife $48.00 CDN in Vancouver’s Chinatown and they are considerably more expensive as you move east. Once prepared and cooked, the flesh of the conpoy still retains a lovely rich sweetness and will add considerable depth to all sorts of dishes. The dried product can be added as is to soups and long-cooked ‘wet’ dishes like casseroles but, generally, they need to be first softened by soaking or steaming. To soak, you simply need to just cover the conpoy with hot water and leave until softened. The length of time will vary depending on size and initial dryness, but anywhere from about 30 minutes to an hour or two will usually suffice. Once softened, the flesh can then be shredded into thin fibers as you see above. After the conpoy are soft, make sure to retain the soaking water as it will be highly flavored and can be added to whatever you are cooking, It can used immediately to give additional depth to the same dish to which the soaked conpoy are going to be added (it is lovely for sauces), or else it can be reserved and then added to other soups or stocks. 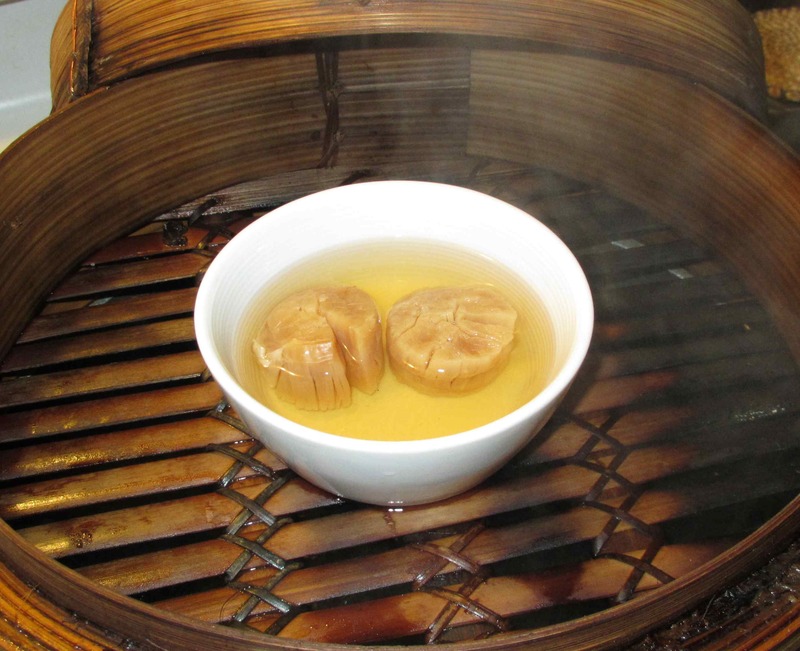 To be honest, I find that simple soaking is all that is necessary for preparing conpoy, (even the larger varieties), but many recipes suggest that they be steamed before use, either with, or without a preliminary soaking. Sometimes, a little rice wine is added to soaking/steaming water (and I added just a little to the ones you see steaming above). I have also even seen recipes that called for the scallops to be completely covered with nothing but rice wine before steaming, and, while I haven’t tried it myself, it rather strikes me as being a bit of overkill. In either event, as with simple soaking, you will want to reserve the liquid for culinary use once the scallops have softened. 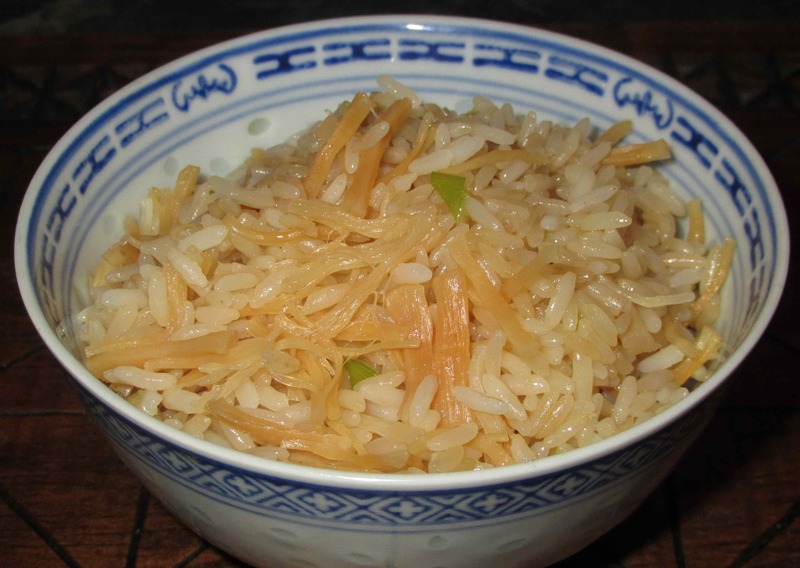 One of the nicest ways to experience the flavor and versatility of conpoy for the first time is shredded into plain rice (using the soaking liquid as part of the cooking medium, of course). 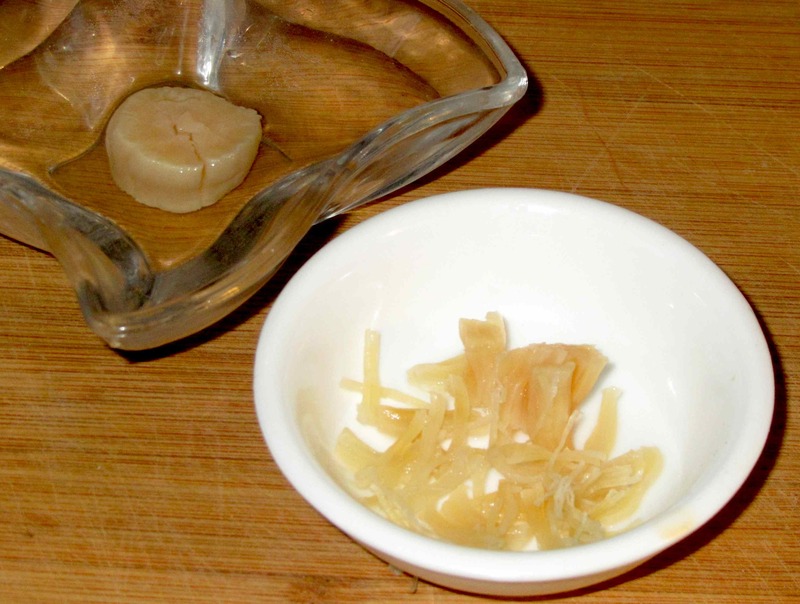 Similarly, the shreds from just a few medium size dried scallops can also be used to add wonderful notes of interest to an otherwise plain dish of noodles. As noted already, conpoy are terrific added to soups, or to other one dish meals such as hot-pots, stews and casseroles. They are frequently paired with eggs in Chinese cookery (steamed or scrambled) and can liven up many vegetable dishes, especially flash-fried greens. In the 1980’s, a cooking and dipping condiment known as ‘XO Sauce’ based on dried seafood was developed in Hong Kong, and this delicious sauce relies heavily on Conpoy for it’s rich, umami flavors. This condiment is becoming increasingly more widely in the west, nowadays, and so it is possible that many people have enjoyed the essence of conpoy if only indirectly. Do these often have MSG or other chemicals? Not sure how I would know this when the labels are in Chinese. I’d love to try working with them – any brand you recommend? Actually, when I buy them in Ottawa, I usually get them in groceries or Chinese traditional medicine stores who sell them in bulk… either they have them displayed in large bins for self-service, or in glass jars behind the counter. My wife bought the pre-packaged ones shown in the post above. I can’t think that MSG woud be added as the scallops are rich in amino acids anyway. As far as I know, the product is just sun-dried scallop…. Thanks! I’m going to look for these. Love scallops in any form. From “the Wife”: Actually, I did buy them from a large bulk bin in a traditional Chinese market in Vancouver. They just packaged them up for me! HI. I have a few bags of dried scallops stored at my home basement. They are put together with other dried seafood. A few days ago, I found out that two bags were emptied leaving some sesame sized black waste drops behind. The holes made on the bags were around an inch in size. I was terrified. My house has never had mice problem before. I have a cat but he hates the smell of dried scallops . Anyone has this kind of experience ? Even well-sealed plastic bags can be chewed into! Be alert when cleaning up the droppings, they are a potential source of e coli bacteria. When I was a lad my father would chew dried scallops like chewing gum at home. Our house had a very distinctive odour when Dad was chewing. 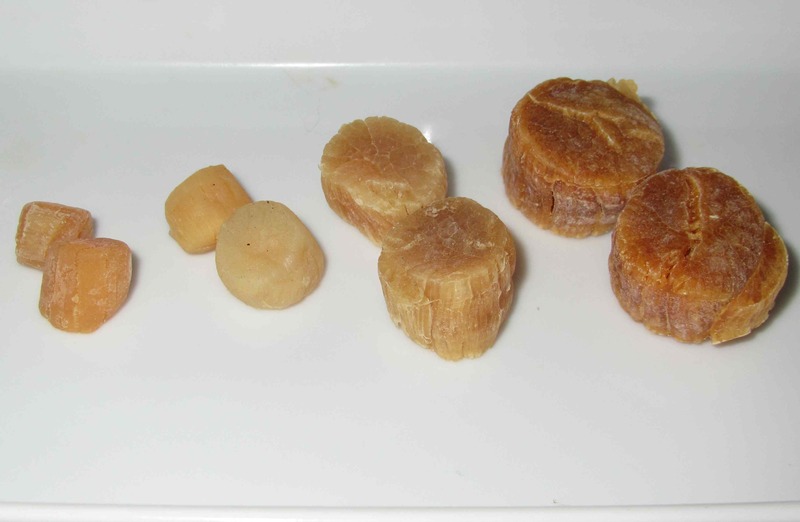 The large dried scallops on the right in the photo are gorgeous. How much did the package of dried scallops your wife bought weigh? They are pricey, but a little goes a long way. From “the Wife”: Actually, the one that John was using, the second largest ones, were priced at $48/lb and I got about a pound and a quarter of them. The second to smallest sized ones were MUCH cheaper at around $17/lb and again, I got somewhat over a pound. This was an interesting post…as far as I know, I have never had them. I know they aren’t sold in our area. Oh, thank you for this post! –you brought back happy memories! When I worked at NIH near DC in the 80’s my best friend was a Chinese woman and she taught me to cook many things you never see in restaurants. We played tennis every morning at 6am and chewed on salty dried plums, they were so yummy! I never tired the dried scallops but loved the dried shrimp. I also remember a potluck party, everyone brought a dish from their homeland. A young Chinese girl, who said se was a scientist not a cook, brought a plastic container of shredded dried pork. A young smart-aleck looked at it and asked who the heck brought a dish of carpet lint? Every single person, even the young girl, at the party laughed until their sides hurt, but sadly no one tried it. The next day the host looked for it and eventually found it under her bed with a very happy cat! 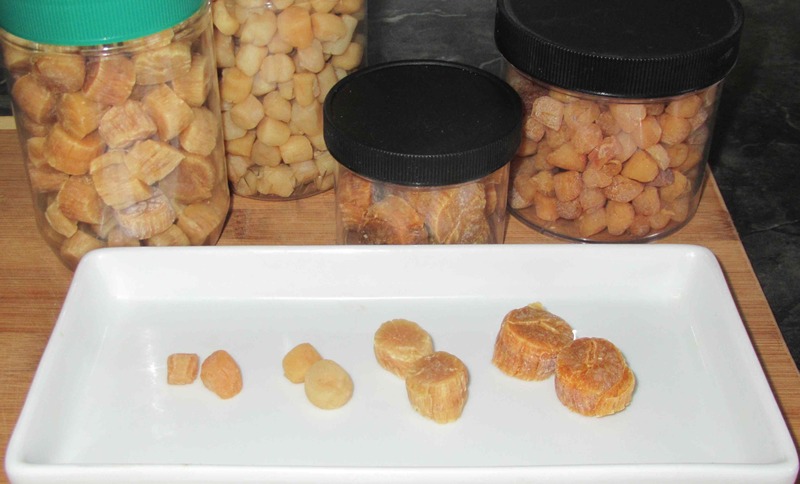 I loved these dried foods, you are so right thinking of them as condensed flavors! It looks like you prepare them as you would dried mushrooms. I am envying your jars of dried seafood joy! I don’t know why your posts did not appear under my Reader anymore…I missed all your interesting posts. I think you have got more dried scallops than me! you are really a big fan of this. It is quite expensive…you know how to enjoy life. Thanks for such an informative post! I’ve had problems with my reader too…. very annoying! Very interesting post! I love how you always come up with new (to me) exotic ingredients. I don’t believe I’ve ever tasted these. I usually prefer fresh over dried, but you have definitely convinced me to try these! I saw your post just after I came back from a visit to the Asian store, so I have to remember to get some next time. I am sure you’ll find all sorts of uses for them. The dried kind have levels of taste not apparent in the fresh! Another one of my mother’s larder staples. Funny that I don’t notice when she uses them (or dried shrimp). She must grind or cut it up super fine. The conpoy shred very finely when you soak them. Some people blend dried shrimp in a processor so that it becomes a ‘floss’! I haven’t try this one,but it’s look good and tasty.